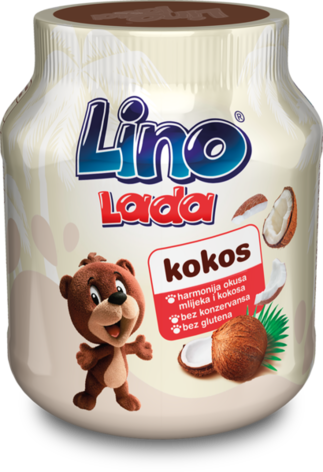 Under its jar lid this new product from Lino Lada family hides an exotic adventure with a taste of coconut! A lot of milk with added high-quality hazelnuts and coconut flour make an irresistible gluten-free combo which will delight both big and small Lino fans. Maybe it will find its place on a slice of bread ?! Or you prefer to discover its sensations in pancakes ?! Or just on a spoon? Your new journey to the sweet side of the world can begin. sugar, whole milk powder (17%), sunflower oil, hazelnuts, whey powder, vegetable fat (palm, soy), desiccated coconut (3.7%), fully hydrogenated rapeseed fat, emulsifier: soy lecithin, flavourings. Storage: in dry and cool place.